Own Agatha Christies - Appointment With Death DVD from Deff, DVD, Blu-Ray & 4K Video Specialists - Free UK Delivery..
Own Agatha Christies - Classic Crime Collection DVD from Deff, DVD, Blu-Ray & 4K Video Specialists - Free UK Delivery.. Murder She Said Murder At The Gallop Murder Ahoy Murder Most Foul..
Own Agatha Christies - Partners In Crime DVD from Deff, DVD, Blu-Ray & 4K Video Specialists - Free UK Delivery..
From the Queen of Crime Agatha Christie, comes a tale of money, manipulation and murder. Self-made multi-millionaire George Barton is a man of influence and power - but even he doesn't have the power to save his beautiful young wife when she collapses, poisoned, at a dinner party. Who amongst his friends and those who 'love' him most might have done such a deed? And what was the motive? The fact that one of the guests is a leading gover..
Angela Lansbury stars as supersleuth Miss Marple who sets about solving a mysterious death in the archetypal English village of St. Mary Mead. Featuring an all star cast including Tony Curtis, Rock Hudson and Elizabeth Taylor. Special Features Interview With Writer Barry Sandler, Interview With Dame Angela Lansbury, Interview With Producer Richard Goodwin, Behind The Scenes Stills Gallery, Costume Designs Storyboard Gallery..
Own Agatha Christies - The Miss Marple Collection (12 Films) DVD from Deff, DVD, Blu-Ray & 4K Video Specialists - Free UK Delivery..
From the Queen of Crime, Agatha Christie, comes a tale of dark forces, black magic and murder. Sculptor Mark Easterbrook finds himself in the wrong place at the wrong time when he stumbles across a murdered priest and the murder weapon turns out to be his. What is the meaning of the list of names the priest was clutching in his hand? And why are the people on that list dying one at a time of apparently natural causes? Money continues to..
From the Queen of Crime, Agatha Christie, comes a tale of murder, mystery and mistaken identity. When Bobby Jones comes across a dying man and the photograph of a beautiful young woman, his interest is snared; especially when the photograph is later switched for one of someone else. With the help of his good friend Lady Frances Derwant, Bobby investigates. Following a trail of clues and setting up an elaborate charade in order to insinu..
1933. 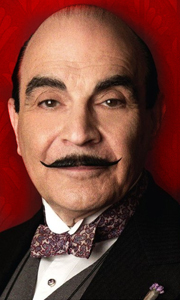 Hercule Poirot (John Malkovich), older and greyer, receives letters threatening murder. The sender signs themselves only as "A.B.C." When he takes the letters to the police looking for help Hercule finds all his old friends have moved on. The new guard led by hot headed Inspector Crome (Rupert Grint) are not interested in his story. But soon there is a murder, and in order to have any hope of catching the killer, the once great de..
Own Agatha Christies - Crooked House DVD from Deff, DVD, Blu-Ray & 4K Video Specialists - Free UK Delivery..
Own Agatha Christies - Hour Collection DVD from Deff, DVD, Blu-Ray & 4K Video Specialists - Free UK Delivery..
Own Agatha Christies - Marple - 4.50 From Paddington DVD from Deff, DVD, Blu-Ray & 4K Video Specialists - Free UK Delivery..
Own Agatha Christies - Marple - The Murder at the Vicarage / 4.50 from Paddington DVD from Deff, DVD, Blu-Ray & 4K Video Specialists - Free UK Delivery..
Own Agatha Christies - Marple Series 1 to 6 Complete Collection DVD from Deff, DVD, Blu-Ray & 4K Video Specialists - Free UK Delivery..
Own Agatha Christies - Marple Series 3 DVD from Deff, DVD, Blu-Ray & 4K Video Specialists - Free UK Delivery..
Own Agatha Christies - Marple Series 4 DVD from Deff, DVD, Blu-Ray & 4K Video Specialists - Free UK Delivery..
Own Agatha Christies - Marple Series 5 DVD from Deff, DVD, Blu-Ray & 4K Video Specialists - Free UK Delivery..
Own Agatha Christies - Marple Series 6 DVD from Deff, DVD, Blu-Ray & 4K Video Specialists - Free UK Delivery..
Own Agatha Christies - Murder On The Orient Express / Death On The Nile/ Abc Murders DVD from Deff, DVD, Blu-Ray & 4K Video Specialists - Free UK Delivery..
Christmas 1954. Wealthy philanthropist Rachel Argyll (Anna Chancellor) is murdered at her family estate Sunny Point. Her adopted son Jack Argyll (Anthony Boyle), a young delinquent, is arrested for her murder. He vehemently protests his innocence. Eighteen months later, Dr Arthur Calgary (Luke Treadaway), a mysterious scientist, walks onto the velvety lawns of Sunny Point claiming to have just returned from an expedition to the Arctic. ..
Own Agatha Christies - Spiders Web DVD from Deff, DVD, Blu-Ray & 4K Video Specialists - Free UK Delivery..
Own Agatha Christies - The Mirror Crack'd DVD from Deff, DVD, Blu-Ray & 4K Video Specialists - Free UK Delivery..
Own Agatha Christies - The Seven Dials Mystery DVD from Deff, DVD, Blu-Ray & 4K Video Specialists - Free UK Delivery..